In order to write a valid self-made will, most states require the testator, or person making the will, to be a legal adult aged 18 or older with the mental capacity to grasp what a will is for and what his own will may do to his property after he dies, according to FindLaw. You must also make your self-made will in writing in most states. You can write your will out by hand, type it or use a preprinted will form in most states. A self-made will must meet your state's requirement for witnesses, just like any other will, according to the American Bar Association. 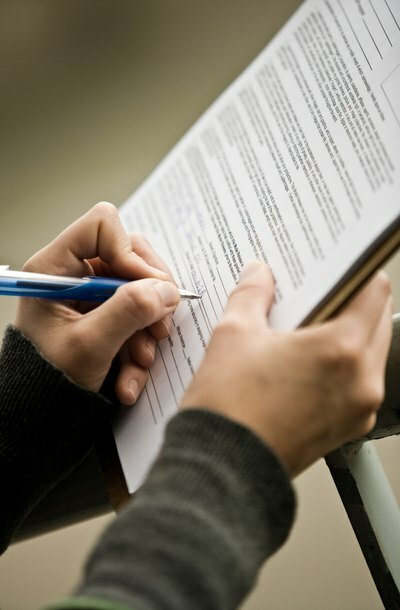 Forty-eight states require two witnesses to watch you sign your will. These witnesses then sign your will as well. Witnesses in all states must be legal adults with the ability to understand what they are witnessing. Vermont requires three witnesses, and Louisiana requires only one witness. Only Louisiana requires you to have a notary sign your will, according to MedLaw Plus. This rule includes self-made wills. Many other U.S. states allow you to use notarization to make a self-proving will. A self-proving will usually goes through probate faster because the probate court does not have to call in your witnesses and ask them whether they actually signed your will. However, these states do not require a valid will to be notarized, and do not accept a self-made will that is notarized unless it is also witnessed according to that state's laws. Some states allow you to avoid needing two or more witnesses by making a holographic or olographic will, one that is written in your own handwriting. In most states, only your name, signature, the date and "material portions" need to be in your own handwriting. These wills do not have to be witnessed or notarized to be legal, but witnesses and notarization may move them through the probate court more quickly because the court will not have to validate your handwriting, according to FindLaw. ABA Family Legal Guide: Do I Have to Write My Will?